This coin was first produced in 1975 in celebration of the 200th anniversary of the independence of the United States. The coin was minted in the years 1975 and 1976 and carried the dual dates of 1776-1976. During the release of the Bicentennial coinage, no coins of this denomination carried the single date of 1975 or 1976. The reverse of this coin replaced the eagle reverse of the Washington coin during 1975 and 1976. 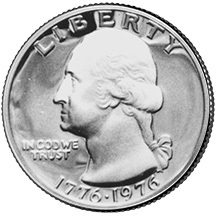 The obverse design features a bust of President George Washington. 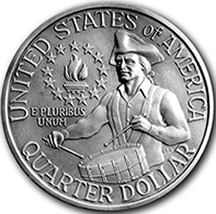 The reverse features a Colonial drummer facing left and a victory torch encircled by thirteen stars at the upper left.